Some past Simic cards were unmistakably for Johnny; Experiment Kraj is the best example of that. But their focus on +1/+1 counters and other kinds of incremental advancement is very much a Spike outlook, and the new Prime Speaker is an unmistakable example of that strain. Her ability is one of the most dangerous in the entire game – just ask Modern players and/or banlist maintainers – and it’s probably just as well she doesn’t do anything else, because anyone who wants that powerful ability should probably have to commit to it when building their deck. She is clearly slowed down by being a creature and having to wait to untap (or gain haste, come to think of it), and this will often make her a very risky play in multiplayer settings. But she has the potential to do pretty much everything Birthing Pod used to do, so be forewarned. I’d be very surprised if she doesn’t find a constructed deck. This can’t end badly, can it? Prime Speaker Vannifar has some rules text that may look familiar: she is, more or less, the second coming of the infamous Birthing Pod, the New Phyrexia artifact that warped Modern into a flood of similar decks. 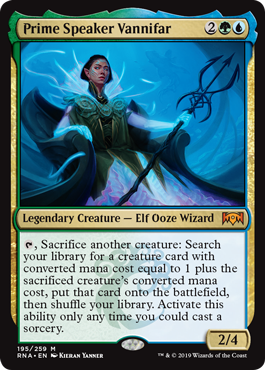 This isn’t a perfect analogy; Vannifar is a bit more susceptible to removal overall, even with that 4 toughness, and she’s not likely to pop the turn she hits. But there are a lot of really unpleasant ways to go “infinite” with Vannifar, like Intruder Alarm and other ways to untap her, and not needing mana to activate her is also a nice little bonus. The value of Birthing Pod tends to manifest itself in deeper formats, with more cards to play with and more mechanics to abuse, particularly undying and persist. The common Birthing Pod chain involved Kitchen Finks and Murderous Redcap, though there were other potent cards like Siege Rhino. Vannifar makes for a bit of a tighter mana base compared to the old Pod decks, since she needs colored mana (while Birthing Pod did not), but the fact remains that Vannifar can be a very vicious enabler in all sorts of decks; once she comes out to play, the value train isn’t going to leave the station. I think Prime Speaker Vannifar is very dangerous. I don’t know if she’ll be potent enough to get banned, but Birthing Pod 2.0 is definitely a card to keep your eye on.